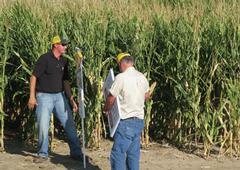 You've heard of this new dry fertilizer, but are still confused as to why it is beneficial? Then read on! Rock 40 offers a great dry fertilizer replacement for traditional 11-52-0 blend. Rock 40 is homengenous so every granule contains the same amount of Nitrogen, Phosphorus, Sulfur, and Zinc. This makes for superior nutrient placement. The 11-52-0 blend has a more varied distribution. Another benefit of using Rock 40 over 11-52-0 is the type of sulfur present in Rock 40. It is more readily plant available over that of the sulfur blended in 11-52-0. The zinc in Rock 40 is also preferred to competitive homogeneous products because of its plant availability. Please refer to the links below for a detailed sketch about nutrient placement. Thank you to all the producers who came to our DeKalb Seed Meeting on September 2nd! We had a great turn out and we are very excited about the wonderful new seed products we have to offer our customers! Monsanto is giving $2,500 away for communities. Click logo below to learn more and apply. corn out of the field and in the elevator. View test plot data at www.monsantoperformance.com.